Your name could win you cold hard cash! Your chance to win $100+ @ 7:20 am, 11:20am, & 4:20 pm! If you hear your name on-air, you have 10 minutes to call 571-1069 to win! Everyday @ 7:20 am, Jesse & MJ will start the Workday Pay Day by saying the name of someone who has entered to win on-air! If you hear your name, you’ll have 10 minutes to call 571-1069! If you call in time, you’ll win $100! The next chance to win $100 is @ 11:20 am! Again, you’ll have 10 minutes to call if you hear your name on-air. If you call in time, you’ll win $100! The last chance to win $100 for the day is @ 4:20 pm! You know the drill! You’ll have 10 minutes to call when you hear your name! If you call in time, you’ll win $100! Here’s the deal though- If you DO NOT call in 10 minutes, that $100 rolls over to the next chance to win! For example, if you hear your name at 7:20 am but you don’t call us back in time, the person whose name is announced on-air at 11:20 am will now be eligible to win $200! If the person whose name is announced on-air at 11:20 am doesn’t call in time, the person whose name is announced at 4:20 pm will now be eligible to win $300! Whatever money that has accrued (if at all) at the end of the day WILL also roll over to the next day! So the payout could potentially be more than $100 at the start of the day! 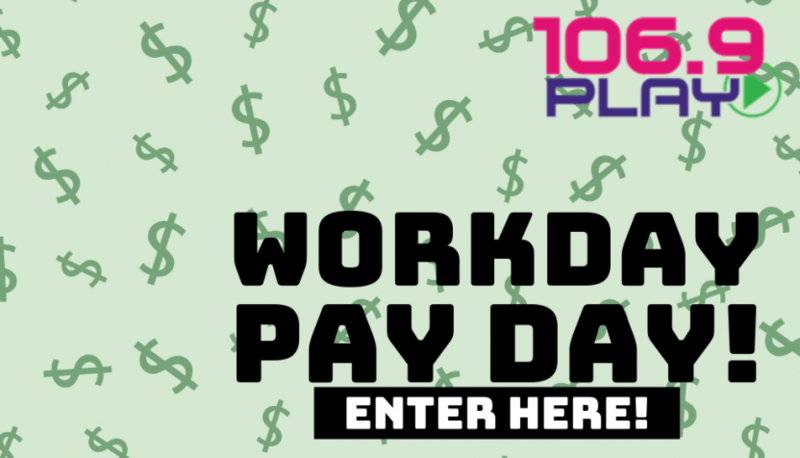 Enter to win the Workday Pay Day below! Make sure it's the best number to reach you!